The temple was finalized to be built at the south-eastern part of the Mysore Palace fort, corresponding with the Trineshwaraswamy temple present at the north-eastern part of the fort. The three main idols were sculpted according to the sanskrit verse(mentioned next section) within a span of one year. The idols of Gayathri, Savithri and Saraswathi in Panchayathana order was consecrated according to the Agamic rituals. 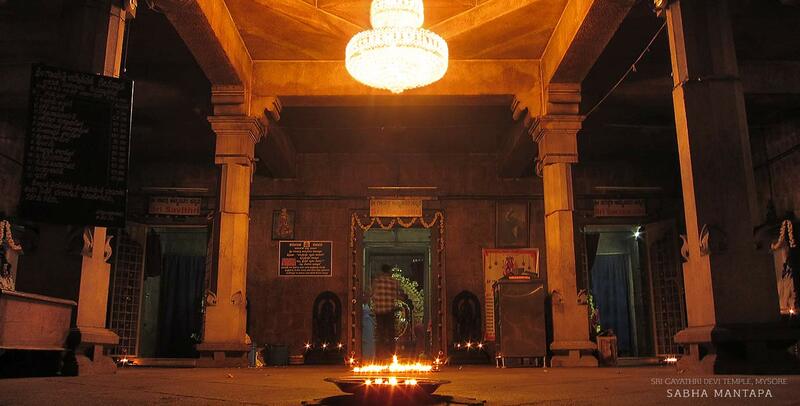 The temple was inaugurated by Sri Jayachamaraja Wodeyar on the day of Vijayanama Samvatsar Chaitra Bahula Bidige(1953). Immensely pleased with the artworks, Sri Jayachamaraja Wodeyar honored the sculptor Sri B.Basavanna with the first-grade medal, a golden chistle, silver hammer and a golden chain during the inauguration. Goddess Savithri is on the right side of goddess Gayathri Devi. She has four arms (two on each side). The right arms hold (top to bottom) the Trishula (trident) and Japamala (prayer beads), the left arms hold Agni (fire) and a Damaru (drum). 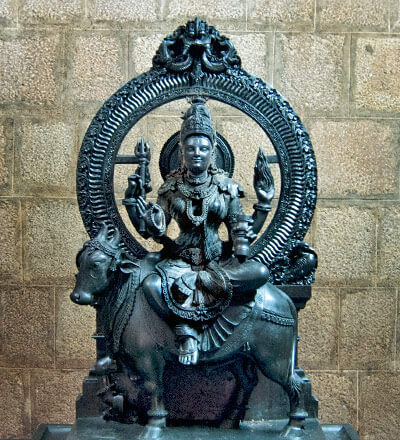 The goddess is seated on Vrishabha Vahana (bull), since Sri Gayathri Devi appears in the form of Rudra in afternoon. 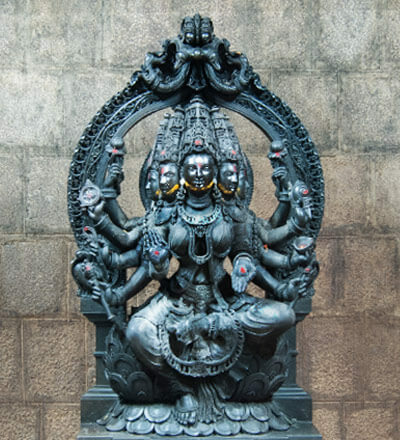 Goddess Gayathri Devi has five heads and ten arms (five on each side). The right arms hold (top to bottom) Padma (lotus), Chakra (disc), Pasha (rope), Ankusha (spear) and Abhaya Hasta (protection). The left arms hold Padma (lotus), Shankha (conch), Kapala (skull), Shakthyayudha (sword) and Varada Hasta (boon). 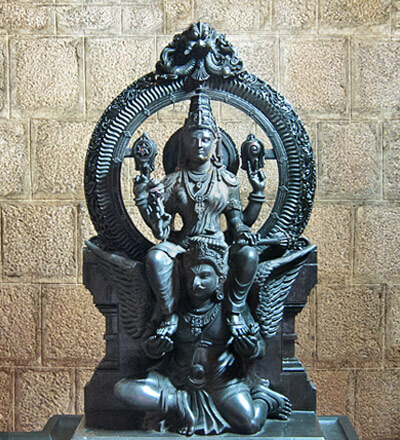 The goddess is seated on Kamalasane (lotus). Goddess Saraswathi (Knowledge) is on the left side of goddess Gayathri Devi. She has four arms (two on each side).The right arms hold (top to bottom) Chakra (disc) and Padma (lotus), the left arms hold Shankha (conch) and Gada (mace). The goddess is seated on the shoulders of Garuda (eagle), since Sri Gayathri Devi appears in the form of Vishnu in evening. On either side of the Garbhagriha, there are sculptures of Dwarapalikes (door guardians). In the Sabha mantapa (meeting hall), are sculptures of Gods Rudra and Ganapati on the right side, Surya and Vishnu on the left side. All are installed in Devakoshta. The sides of the koshta are decorated with Makara yali. 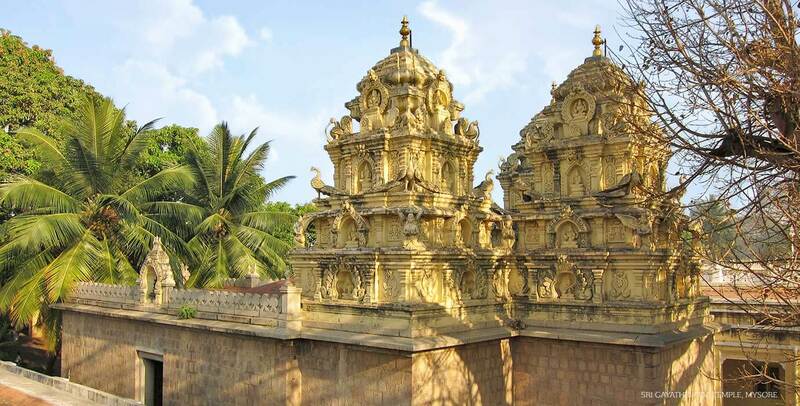 On the parapet, sculptures of goddesses Gayathri, Savithri and Saraswathi are present on three sides. These are also placed in Devakoshta with kalasha on the top. The temple gopura consists of about 48 sculptures related to Hindu epics. The superstructure of the temple is built in stone and the parapet is built with brick and lime mortar. 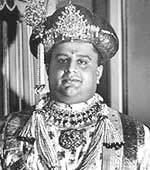 Sri Jayachamaraja Wodeyar was the 25th and the last Maharaja of the princely state of Mysore from 1940 to 1950. 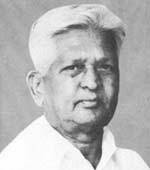 He graduated from the Maharaja's College, Mysore in 1938 with five gold medals. He was the recipient of D.Lit from Queensland University, Australia, Doctor of Law from Banaras University, and D.Lit from Annamalai University. He was a prolific composer and a greatly talented musician. The music of Mysore reached it's zenith during his rule. He also sponsored the translation of many literary classics from Sanskrit to Kannada as part of the Jayachamaraja Grantha Ratna Mala, including 35 parts of the Rigveda. Born to a Sculptor family in T.Narsipur taluk, Sri B.Basavanna came to Mysore at the age of 9. His keen interest in stone sculptures lead him to be trained by the legendary sculptor Shilpa Siddanthi Sri Siddalingaswamy for twenty years. His first assignment as a independent sculptor was sculpting the statues of Gods and Goddesses to Arsikera Srya Mandali. He was awarded the title Shilpa Kala Rathna. After this he got an opportunity to sculpt a statue for the then prime-minister of India-Sri Jawaharlal Nehru.